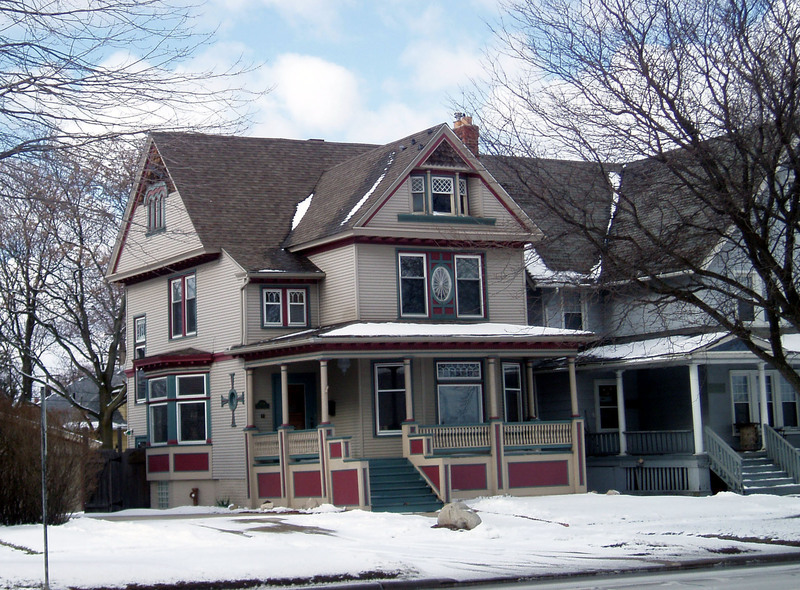 William Armstrong, a prominent Wyandotte businessman, had a local architect, Edward Harding, design this large late Victorian residence for his family. This is a two-and-one-half story symmetrically cross-gabled structure. Originally this house was, I believe, shingle-sided but now the exterior may be covered in more modern siding. Perhaps the most striking and memorable feature is the large veranda facing Biddle Avenue with a roof elegantly supported by Tuscan columns protruding from substantial pedestals. Note the several decorative windows, including the unusual oval fanlight at the center of the home between two rectangular windows. The architect decorated every flat surface of this structure in an interesting variety of ways. I do not know how William Armstrong earned the funds necessary to build this imposing home. An Armstrong family was among the early settlers of Wyandotte but I do not know if he were a member of this founding family.